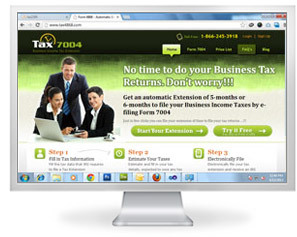 Tax7004.com is leading e-file tax preparation software for federal tax form 7004. Federal tax preparation for Tax 7004 is made easy by means of our efficient tax return services. Federal tax form 7004 is used to request for an extension of time to file for certain business income tax returns, information and other returns. E filing tax return form 7004 does not extend the time for payment of tax. You need to file a separate tax return form 7004 for each of the tax return you are requesting extension time to file. The tax extension request is only to the form identified in line 1a or 1b. Federal tax form 7004 should be filed on or before the due date of applicable tax return. The due dates for filing tax return with Federal tax form 7004 can be found in the tax instruction of the applicable form. Our tax return software is authorized by IRS for providing e file tax return service. Thus our tax return software is reliable and safe for e-filing federal tax form 7004. Our tax return software uses sophisticated tools for all of our applications and tax services. Our tax return applications are designed by expert tax professional with extreme care and expertise to deliver the best for our users. The security features of our site are enabled by world-leading organizations like Thawte and McAfee. Thus our tax software offers excellent security for tax payers’ financial information. Our tax preparation services are accurate and exact. So taxpayers need not perform complex math or calculations. Thus we enable easy tax return filing. Our tax return software is designed by tax professionals who have many years of rich knowledge and expertise in tax domain. Thus we provide high quality services which are highly customized for user benefits. Our tax professionals guide you through phone, mail, and online chat. One more special feature of tax return software is online tax professional support using which you can clarify your tax related queries instantly.